Of course, we are super proud of ALL of our players, but everyone knows there can only be one MVP. Behold, our MVP for our Inaugural Bout: Buckhead Betty! 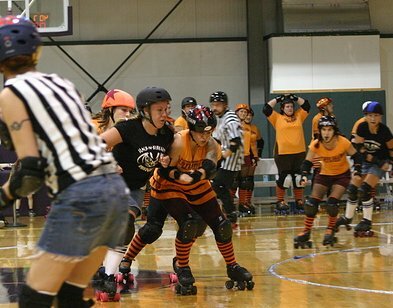 With the highest stats for Whips, Pushes, AND Jammer takedowns (5), Buckhead Betty was a force to be reckoned with, or, according to the announcers, a “One Woman Wrecking Ball”.